Are you FNQ's runaway bride? Police have found an unusual item. Cars, house keys, cash, phones, you name it- our Far North Police officers have seen it all. But, this one is a new sight for them- a very colourful wedding dress, or maybe it's a debutante dress? 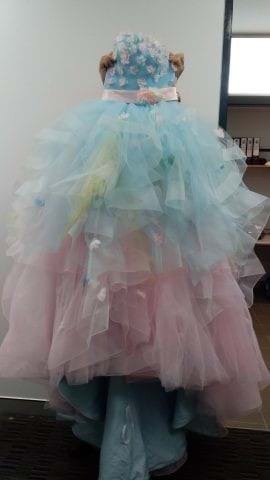 It was left at Muddy's playground on Thursday and is said to be made from pastel flowers, multi coloured tulle and has a blue satin train. Police are now asking some hard hitting questions. Will the dress's discovery add to a bodice of evidence supporting a stealing offence? We don't know what sequins of event led to the dress being discovered..
Did the bride get cold feet? Was it left behind by a local? Cairns Police would love to get it back to its rightful owner so please give them a call on 4030 7207 if you know who it belongs to.